Marillier is an amazing author. Every part of this book was lyrical and flowing. There was no dialog that I thought was too stilted or unbelievable. While her characterization does take on a more black and white approach than I normally like, it works for this book. Furthermore, what impressed me the most is how well she made the story work when th lead character couldn’t talk through most of it. I can’t imagine how hard that must have been for an author to write and make work as beautifully as she did! The story is set in ancient Ireland and England. I need to do some research, but it seems like Marillier must have heard an ancient story somewhere or another and decided to turn it into a trilogy. She did her research, that is obvious in her work. She has nuances of Irish culture down pat and shows small aspects, like their love of story telling, truly. This work is told in almost mythic pros. That may bother some people, but it is essential to the story and it works very well. This story does contain romance but it is perhaps one of the best told romances I’ve ever read in my long history of reading. It’s not overbearing, but comes naturally. This book is packed full of emotion and there were parts where I was choking back tears, which I rarely do with books. The lead character is sent through hell before the book comes to a neat ending. The ending leaves several ends untied for the other works in her Sevenwaters trilogy, and perhaps that’s why it was bittersweet to me. Happy on many levels, but heart wrenching on others. This book worked it’s way into my brain. I dreamed about it all night and woke up with my fingers aching to get on the next book in the series. Probably one of the most stunning works of fantasy/historical fiction I’ve read in a long, long time. 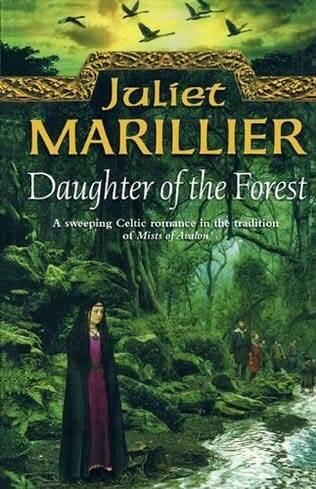 Marillier is an author other authors should watch out for. I will throw out a warning. This book is more on the feminine side of things so if you want blood, gore and guts don’t read this. It’s a sweet story, and very engaging, but it is very female. Recommended for: Anyone who enjoyed Marion Zimmer Bradley’s “Avalon” series, people into romance, those who enjoy myth/fable, happy endings, thought provoking works.